Cadence is the first EDA supplier to achieve comprehensive “Fit for Purpose - Tool Confidence Level 1 (TCL1)” certification enabling automotive semiconductor manufacturers, OEMs and component suppliers to meet stringent ISO 26262 automotive safety requirements. Cadence® tool and flow documentation was evaluated by TÜV SÜD, an internationally accredited independent testing and conformity assessment company, and deemed to be fit for use with ASIL A through ASIL D automotive design projects. Cadence offers automotive Functional Safety Documentation Kits covering the full spectrum of semiconductor design and verification. The kits satisfy documentation requirements that the automotive component supplier must provide for their tools and flow to achieve ASIL certification. Additionally, the kits reduce the effort required to evaluate tool use cases within each of the supplier’s automotive design projects and help automotive component suppliers avoid the costly efforts of tool-qualification activities. While the user still has the responsibility to provide assessment documents for each tool in the flow, there is now a defined structure and methodology to do so. The Cadence approach automatically accommodates new tool versions or even new tools in the flow. 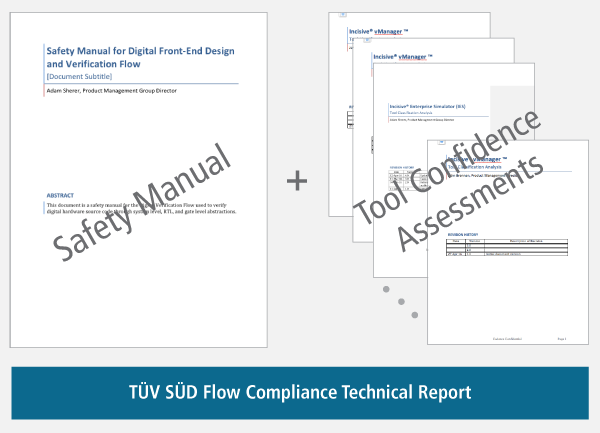 Cadence will provide updates to the kits as needed, but effectively, the completion of the TÜV SÜD evaluation applies to current and future versions of the Cadence tools and flows. Digital implementation and signoff flow: This flow covers RTL-to-GDSII implementation and signoff. The Cadence Liberate™ Characterization Solution is new to this flow and is incorporated with the 13 other pre-existing tools including the Cadence Innovus™ Implementation System, Genus™ Synthesis Solution, Modus DFT Software Solution, Tempus™ Timing Signoff Solution, Quantus™ Extraction Solution and Voltus™ IC Power Integrity Solution for the implementation and signoff of automotive designs. PCB design and verification flow: The PCB design flow includes everything from design authoring to simulation to physical realization and verification using the Cadence OrCAD®, PSpice® and Allegro® product suites. The high-performance design entry, simulation and layout editing tools included with these suites provide an integrated environment for design engineers to validate the safety specifications against individual circuit specifications for design confidence. Digital front-end design and verification flow: The flow documentation kit covers specification to RTL design to verification. The front-end digital tools include the Cadence Genus Synthesis Solution and Conformal® Equivalence Checker. Functional and safety verification capabilities are provided by the Cadence Verification Suite, which includes the Cadence JasperGold® Formal Verification Platform, Xcelium™ Parallel Logic Simulator (to be added to the flow documentation in Q4 2017), Palladium® Z1 Enterprise Emulation Platform, Protium™ FPGA-Based Prototyping Platform, vManager™ Metric-Driven Signoff Platform and the Indago™ Debug Platform (to be added to the flow documentation in Q4 2017).